In the time it takes to get a patch written, tested, reviewed, etc. Drupal continues evolving. As Drupal evolves, the patches must be kept up to date. For example, imagine a patch that was originally created to make some edits to line 5 in file X. Two releases later the patch should actually edit line 10, not line 5. Now the patch has to be updated, or "re-rolled". Sometimes re-rolling a patch is complex, but usually it's pretty simple. Git provides some handy tools that will let you apply the patch to the version of Drupal it was written for, merge the changes into a newer version, and then re-create the patch. Know how to and apply and test patches. 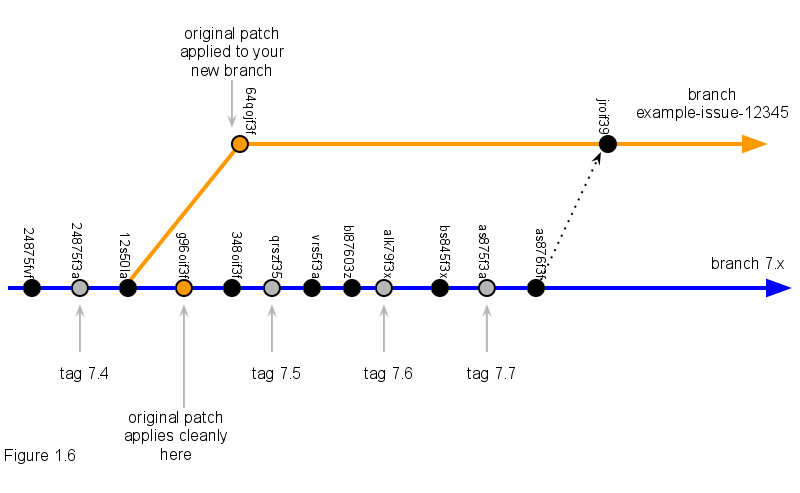 (Helpful but not required) Knowledge of Git branching and merging, tagging and rebasing. Before getting started, it helps to have a basic understanding of what we're about to do with Git. Here's a brief overview of what's going on in Git during the patch re-rolling process. Every saved revision of a Git project is called a 'commit'. Every commit in a project's history has an ID number (Figure 1.1). When a new Drupal release comes out the project is tagged with the release number, for example,7.4, 7.5, 7.6, 7.7. A tag is just an alias for a commit ID. It is a human readable name assigned to a specific revision of the project. (Figure 1.2). Finally, we re-roll the patch by getting the diff between our local branch and Drupal's development branch. Then we save the new diff as a patch and post it on drupal.org. Go to the Drupal core issue queue and find patches that need to be reviewed by filtering the list of issues tagged as "Needs reroll". We will use the example in https://www.drupal.org/patch/reroll which is based onthis issue. This example may not work at the time you're reading this, but it will help you to familiarize with rerolling patches. Find a patch that was created a while ago. Download and try to apply the patch. If it applies cleanly, add a comment to the issue stating that "the patch applied cleanly" and remove the tag Needs Re-roll. Then go back to step 1. If Git reports errors when trying to apply the patch, the patch needs to be re-rolled. git log -1 --before="March 30, 2012". Take the first few characters of the commit hash you see there (in this case, 72cf5a755) and checkout the code from that commit. checkout -b means to create a new local branch and automatically switch to it. In the following example, cmi-statistics will become the name of the new branch. You can choose a different name. If you see no output, you're good to go. If you get similar "patch does not apply" errors, delete your current branch and repeat the previous step with an earlier commit hash (e.g. e179ee1d6 in this case). Commit the patch's changes to your local branch, run git status to see these changes. Avoid adding files which weren't in the initial branch, like the patch. 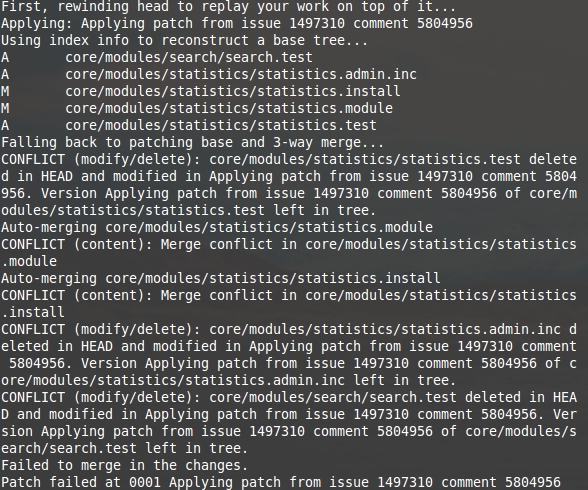 git commit -m "Applying patch from issue 1497310 comment 5804956"
Now, attempt to pull in all of the changes that have happened since the commit you branched from. Any rows that begin with "CONFLICT" are the ones you'll need to sort out in order for the patch to apply cleanly. Everything above the ======= is from the "clean" upstream version. Everything below the ======= is found in the patch you are rerolling. In general, you want to keep what's in the clean upstream version, and then modify it to follow the changed behavior from the patch. This ensures that any other changes that have been made to the upstream version not affecting your patch do not accidentally get undone. Edit the file until it looks correct, making sure to remove the special conflict marker lines. and repeat the previous steps until there are no conflicts left to resolve. Test your patch by applying it to the upstream branch. If the patch apply cleanly, you've just re-rolled a patch. Congratulations!. Hiya. Great tutorial. Just wanted to point out that on http://drupal.org/patch/reroll they suggest to use 'git rebase' instead of 'git merge'. It was confusing to me, initially, which instructions to follow. Took me a while and a lot of Googling to figure out that they both end up essentially with the same result, although rebase gives you one commit, and merge gives you two: your original commit + a merge commit. (2) Perhaps more detail on STEP 8 would be hepful. It might also be a good idea to introduce people to gui-based 3-way merge tools or to 'git mergetool'. Before doing this thing i thing that a person has to qualified engineer then h/she can do this one. New Version of drupal is amazing but it is really typical. I am thinking to learn it properly so I took help with assignment UK for better guidance.